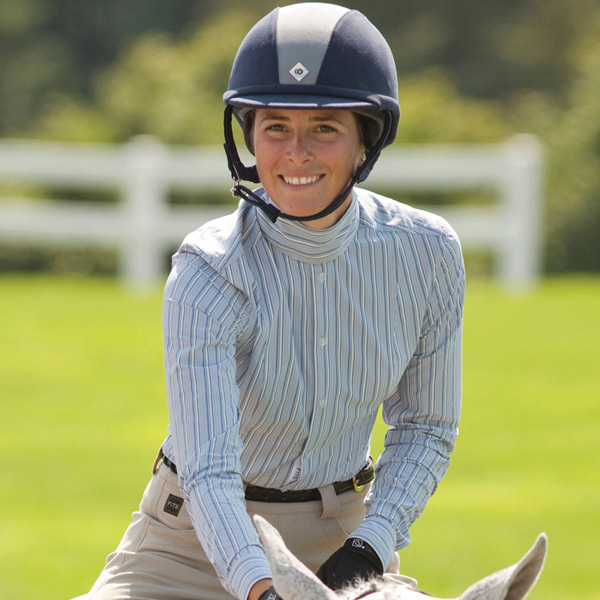 Innovator and FITS founder/CEO Sheryl Rudolph may be best known for her revolutionary approach to full seat breeches. But hunter/jumper riders need to take note of the new FITS Silk Touch Show Shirt – quite possibly the most comfortable and best-fitting show shirt we've ever worn. Just as riding coats made from high-performing, technical fabrics were a long time coming, a long-sleeved, "ratcatcher" style show shirt that didn't feel like riding in your boyfriend's dress shirt has been, until now, nearly impossible to find. The Silk Touch shirt is, as the name implies, incredibly soft to the touch. The fabric is also designed to breathe while worn under a hunt coat, with a smart powermesh underarm gusset for ventilation (no more sweat marks!). Since it's 4-way stretch, the shirt allows for an athletic range of motion across the shoulders and through the arms (like releasing over a jump!). We also love the tailoring- slim enough to avoid bunching at the waist and long enough to stay tucked in to low-rise breeches. You know we've said it before: if you're focused on being uncomfortable in your clothes, you're not fully focused on riding your horse. We recommend this shirt as a winning combination of comfort and classic styling. Thanks Merry Ann. Add me to your list if you haven’t already, and email me anytime at molly@dappledgrey.com.